The concept of “thinking outside the box” has been the go-to, we’re-all-about-it superstar for decades. TED Talks offer up a chorus of praise for this invocation to innovation, certain to bring greater success to businesses and organizations. Proponents say thinking outside the box fires up creativity and that it can result in inventive solutions to an organization’s most nagging problems. But for all the positive promotion it’s received over the years, that philosophy may be putting too much emphasis on the wrong side of the box. I believe, and our work has found, that you have a much better chance of success if you understand the parameters you’re working within as an organization, and then see if you can stretch the box to meet your goals and vision. In other words, taking into account real-world limitations—such as budget constraints, industry regulations, looming deadlines—can actually help to spark creativity by keeping it focused rather than using an open-ended, anything-goes approach that doesn’t reliably result in ideas that can be implemented from a practical standpoint. Thinking outside the box sounds like a great way to spur creativity and innovation, but it can take you in directions far removed from your true goals or what you can actually accomplish. We find it to have ambiguity in that there are no boundaries, there are too many variables and too many unknowns. When working in the box, your playing field is more defined and there is greater understanding of specifics and their possible impact on your desired outcome. There is also more empathy and connectivity in the box because there is definition. The box perspective is not only critical for the leader to define the parameters of the organization, it is equally important for the employees to have clarity around the business focus and the elements that directly affect them. Furthermore, the box provides a critical context for the board and leader to work together and create commonality around the expectations of the company. The box provides a form of clarity for all to grab hold of and work toward. The powerful point is that the box is of your own making. There are no rules or regulations with the box. There is no size requirement. Only you can determine the right box for your company, one that is big enough for your wildest performance objectives, but focused enough to allow you to achieve the goals you establish. You should also understand that while the sides of the box exist, they can be permeable, to let things flow in and out, and be flexible, to expand or contract when deemed necessary; but, once inside, each element serves to interact with the whole. This in itself contributes to being in clarity. While society celebrates wild, outside-the-box ideas, even though most of us don’t have the creativity or vision to really be far outside, the complexity of today’s business environment dictates that you must be more focused, more purposeful, more connected, and more strategic. The definition of your box and willingness to push the parameters inside the box is therefore critical to your long-term sustainable performance. These four components are the critical factors that contribute to and directly affect performance and culture. 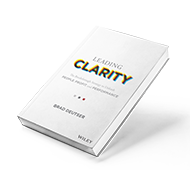 Organizations that put the effort into defining their box by actively planning for, talking about, and populating each of these sides are those that can uncover clarity—the gem inside the box—and through the processes presented in this book, drive vibrant and lasting performance. Now that we have four sides of the box, it is important to provide greater definition by populating each side with three dimensions, each critical to organizational performance. When you think inside the box, you’ll have a better handle on the organization’s structure, strategy, and culture as well as their undeniable impact and influence on each other. That in turn will help determine the best way to shape, grow, and stretch the organization’s box to meet and ultimately exceed goals. While thinking outside the box offers the allure of freedom without constraint, thinking inside the box actually gives you structure and an approach to thoughtful expansion, which provides more effective thinking freedom with the foundational mediums from which to springboard. Working inside the box generates collective impact where you can identify and envision your future state as well as understand your current state. We believe that it is the expectations leaders set that serve to close the gap between their current state and desired future state. Without strong leadership, established and exhibited values, clear vision, and a strategy to achieve the vision, an organization will not be successful.